Collinear: Contained by one line. Manipulative 1 - Collinear Points Created with GeoGebra. If points are collinear, they are in the same line. Since two points define a line, any two points are collinear (see figure 1). If three points are collinear, a line drawn using any two of the points will contain the third (see figure 2). If objects are non-collinear, no one line can be drawn that contains all the objects (see figure 3). Collinearity: Having to do with whether or not objects are in the same line. 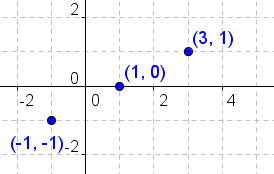 Figure 3: Graph with 3 points. In 2-dimensional analytical geometry, each point has an x-coordinate and a y-coordinate. These coordinates can be used to see if three are collinear. To see if three or more points are collinear, pick one of the points as a reference point. If the slopes of the lines defined by the reference point and each of the other points are equal, the points are collinear. Table 1 shows the steps for determining if the points in figure 3 are collinear. 1 This algorithm starts with the equation of a line in point slope form. 2 Start by selecting any two of the points. For this demonstration, select (-1,-1) and (3,1). 3 Use the slope formula to determine the slope of the line defined by the two points. 4 Now pick one of the points already used and the third point. 5 Find the slope of the line defined by those two points. 6 Since the slopes are equal, the three points are collinear. Table 1: How to find out if three points are collinear. McAdams, David E. Collinear . 12/21/2018. All Math Words Encyclopedia. Life is a Story Problem LLC. http://www.allmathwords.org/en/c/collinear.html.